This week in political economy. House and Senate Republicans released the final version of their tax bill late Friday afternoon. The Washington Post breaks down the bill, which includes a reduction of the corporate tax rate from 35 percent to 21 percent. Earlier this week, as reports surfaced that House speaker Paul Ryan is contemplating retirement, International Business Times’s David Sirota, Alex Kotch and Josh Keefe reported that Ryan and other top Republican lawmakers could reap an enormous personal financial windfall from the real estate tax breaks they included in the bill. In The New York Times, Kenneth P. Vogel and Jim Tankersley reported that in hours prior before the release of the final bill, lobbyists rushed to find “ways to persuade, influence or cajole the small group of lawmakers empowered to tweak language in the final version.” Also in IBT, lobbying expert Lee Drutman explains how corporate influence in Washington works. The Federal Communications Commission voted on Thursday to repeal net neutrality, the Obama-era rules that prevented internet service providers from blocking or charging more for certain kinds of content or services, granting ISPs the power to reshape the internet as we know it. The decision was made despite the FCC’s chief technology officer warning against it, according to Politico. While polls suggest the net neutrality repeal is opposed by 8 out of 10 Americans, it was incredibly popular in the ISP industry, which according to this roundup by OpenSecrets.org has contributed $110 million in lobbying for it just this year. The Verge, in collaboration with the Center for Responsive Politics, breaks down exactly how much each of the 535 members of Congress received from ISPs. Wired offers highlights of the FCC meeting itself, while Business Insider reports on the uproar caused by the FCC voted among tech firms. In The New York Times, Nick Frisch writes about what this decision could mean for freedom of speech, arguing that the repeal of net neutrality brings China’s “nightmare scenario” to America’s digital doorstep. 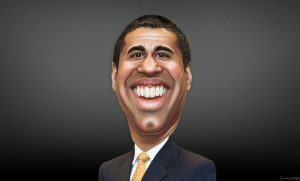 FCC chairman Ajit Pai, for his part, argued that net neutrality supporters have been “proven wrong” by the fact that ISPs did not roll out new charges immediately after the vote. In Boing Boing, Harold Feld argues that Pai’s claim that the Federal Trade Commission will guard against ISPs abuse in the new world without net neutrality does not hold water. Don’t miss Harold Feld’s ProMarket piece on how the repeal of net neutrality will likely drive a massive “arms race” by providers to vertically integrate and to discriminate against unaffiliated services. Also on Thursday, the FCC voted in favor of reviewing the rule that limits the share of TV stations that can be owned by a single entity. The current limit says a single company can’t own stations that reach more than 39 percent of the US population, but Trump’s FCC has sought to relax those rules or eliminate them entirely. The main beneficiary: Sinclair Broadcast Group, a close Trump ally that we’ve written about before. In other media merger news, Disney is buying most of Rupert Murdoch’s 21st Century Fox for $52.4 billion, making the world’s largest entertainment company an even bigger behemoth. How Trump’s Justice Department will react, given that it is currently trying to block another huge media merger in AT&T—Time Warner, remains an open question for now. Don’t miss our extensive coverage of the populist plutocrats phenomenon and its broader implications in the United States and worldwide. In New York, Kevin Carty, Leah Douglas, Lina Khan, and Matt Stoller of the Open Markets Institute offer six ideas on how to “rein in Silicon Valley, open up the internet, and make tech work for everyone.” These range from jailing bosses who use contracts to lock down workers, to stopping Amazon from selling products below cost and stopping Google from steering search engine users to its own apps. In the Financial Times, Rana Foroohar argues that Big Tech has much to rejoice over in Senator Al Franken’s resignation. Meanwhile, Politico’s Nancy Scola reports that the purportedly left-leaning giants of Silicon Valley have a new partner in their DC efforts: Charles Koch. The merger frenzy in health care continues: two hospital giants, Ascension and Providence St. Joseph Health, are in talks about a possible merger, reports The Wall Street Journal. Read our 2016 piece on the true price of reduced competition in health care: hospital monopolies that drastically drive up prices. A new VoxDev column recaps a study by researchers at the Paris School of Economics and Princeton (Lehne et al., 2017) looking at corruption in India’s Pradhan Mantri Gram Sodak Yojana (PMGSY) road-building program. The researchers examined 4,058 elections in 24 Indian states and found that after elections there is a significant boost in procurement contracts awarded to contractors who share the winning candidate’s last name. Roads built by these contractors cost more, more frequently fail quality inspections, and are less likely to ever be built at all. The number of these ‘missing roads,’ say the researchers, has reached 497, depriving 857,000 people of all-weather road access. Read our op-ed from legal scholar John Ackerman on how corruption in Mexican politics is met with near-total impunity. A week after the release of much-publicized research from Bell et al. (2017) on the toll taken on innovation by the “lost Einsteins” among women, minorities, and the poor in America, a new NBER paper from Aghion et al. (2017) uses data from Finland to examine who becomes an inventor. They find that the income of potential inventors’ parents matters, but matters less after controlling for the potential inventor’s IQ and education levels, although the father’s income remains significant in determining whether high-ability children go on to become inventors. Read an extract here on the effect of medical licensing on health care prices from Brink Lindsey and Steven Teles’s acclaimed new book The Captured Economy. ProMarket contributor Fiona Scott Morton appeared in October alongside other leading antitrust scholars at the “Unlocking the Promise of Antitrust Enforcement” conference at American University. Now the conference website has launched, making available videos of all sessions, links to the papers presented, and related resources that together constitute a treasure trove for competition boffins. Sign up for our upcoming January 18 event: a conversation between Stigler Center Director Luigi Zingales and Duff McDonald, author of the recent The Golden Passport, on the MBA elite and the limits of capitalism. Details here.